One of the main benefits of Decision Automation is a significant improvement in business productivity by using a Decision-Centric Approach. In the first part we discussed the importance of making decisions the front-line focus of day-to-day operations in organizations. In this post we look at the high-level steps required to achieve this outcome. We also examine the advantages of a decision-centric approach once it is adopted within an organization. Every day, businesses make operational decisions. Not a day goes by without hundreds or even thousands of business decisions being made. Adopting a decision-centric approach changes the focal point from processes, applications and systems to pragmatic business outcomes. 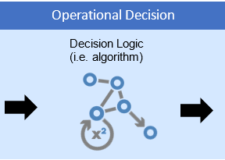 The decision-centric approach will enable organisation to fully automate operational decisions based on the Gartner’s model shown above is “Decision Management for Decision Automation“. It is very interesting to see that once again Gartner have started referring to the OODA loop in their recent articles. What are the steps required to apply the OODA loop for Decision Automation? Begin by understanding which operational decisions are perceived as the critical to business and how these relate to the company’s overall strategic goals and objectives. Figure out how these decisions might impact any metrics which are used to measure the relative success of the business. In other words, understand which decisions will give you the biggest ‘bang for your buck’. By identifying these decisions up front, organization will establish focal points for eventual automation and the strongest return on investment. The next logical step is to separate these decisions from current day-to-day business processes, applications and IT systems. This enables companies to manage them independently from applications, processes, etc. To do that, start by modeling the decisions themselves. This ensures that decisions become first-class citizens of the organization. The decision-centric approach enables stakeholders to clearly understand how decisions are being made and how to assess ownership of those decisions moving forward. Business may then establish appropriate metrics and KPIs for these decisions if these do not already exist. Fully automated decisions require the support of all four stages of the observe, orient, decide and act (i.e., the OODA loop). During the previous steps, we covered the ‘decide’ stage. On this step, we are going to discover and identify three pieces of knowledge for the observe, orient and act stages of the OODA loop. Firstly, we need to understand what those decisions need in terms of data, information, systems, etc. Where are these stored and how are these collected (observe)? Secondly, in what context (scenarios) are these decisions being used? Do we need to compile new information from the data collected (from the observer stage) for particular (context) scenarios? Will these need any form or rules and prediction in order to reason and create the context for the decision? (orient). Lastly, identify how to apply the results of these decisions. Identify the actions these decisions will perform once they reach their conclusions. These three steps provide the basis for building both automated and intervention-enabled decisions. 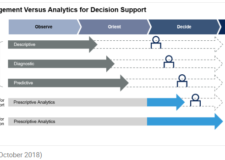 The decision-centric approach enables organizations not only to identify and model these decisions and their relevant requirements in terms of data, information and dependency on other decisions, but also empowers them to manage, execute decisions and perform actions once the decision is reached independent of applications, processes and etc. So what are the specific benefits of decision automation for businesses when it comes to using the decision-centric approach? The decision-centric approach allows organizations to manage, execute and monitor decisions as first-class citizens of the organization. Therefore, business decisions are no longer embedded in multiple systems and processes. As a result, the decision-centric approach streamlines any necessary changes to the day-to-day operations model, as this no longer relies on the full IT lifecycle. This means the separation of decisions from application and system requirements. Therefore, there are no longer lengthy delays while IT compiles a list of applications, systems and processes requirements for a new release. It provides an independent life-cycle for decisions. And on top of those, companies need to continuously tap into new types of customers for existing and new market segments. The decision-centric approach enables organizations to pursue this path by empowering them to test and adapt to a new customers’ journey quickly and effectively. Decision automation using the decision-centric approach means less interruption in processing due to items being delayed as a result of being put into work queues. For instance, in claim handling scenarios in many industries, regardless of whether the company’s platform is fully digitized or not, claims are still being processed manually. In the decision-centric approach, systems are designed to ensure that only exceptions require some form of manual intervention or manual processing. Even when this occurs it is minimized, as the necessary decisions are clearly defined for the staff who are responsible for managing exceptions as part of the decision automation platform. More often than not it is a big challenge for data scientists and technical teams to articulate the benefit of accuracy in analytics and AI models. The decision-centric approach enables the team to clearly state the benefit of mathematical accuracy and build the business case on how this will have a positive impact on business values. 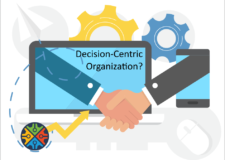 The decision-centric approach in decision automation enables the team to utilize a common business language with different stakeholders and exemplify the business benefits of the solution. There are many references as to why moonshot AI projects have not been successful. To reduce the risk of AI projects, a good way to look at these is that they are about decision automation and consequently break them down into smaller decision models. The next step is to solve each individual decision using technology. Usually that will result in the resolution of bigger decisions in conjunction with the use of different technologies and AI. The decision-centric approach enables to organizations to consolidate, execute and manage these effectively. It lets team break the problem down and solve it one piece at a time. This type of business agility decision-centric approach empowers companies and is essential in an environment that embraces rapidly changing policies and responds appropriately to competitive pressures. It gives executives and middle managers control over day-to-day operational decisions and benefits both customers and staff alike. Customers receive personalized service and staff work more effectively by focusing on higher value tasks. It also helps IT to articulate the benefits and breakdown complex analytics and AI projects. It’s a win-win situation all round. How to become a Decision-Centric Organization? Why should you care? Business rule engine and application logic framework. Get started.